Imagine you’re the designated driver at a friend’s house party. Everyone around you is floating around the room in an alcohol-induced stupor; talking, laughing, spilling things, maybe even falling over, and they’re all finding everything, no matter how mundane, hilarious. Yet, there you are, sober, on a different plane, and wondering what it is that everyone else finds so funny. That’s what it’s like sitting in the audience watching the new comedy from Britain, Absolutely Fabulous: The Movie; they’re all drunk and you’ve got the keys to the car. As a huge fan of the TV series, the one thing that becomes obvious from the get-go is that here is not the place to climb on board the Ab Fab carousel and expect to know what’s going on. If you’ve never been on the ride before you’ll have no idea why people around you are already laughing at the mere appearance of the film’s two colorful leads. 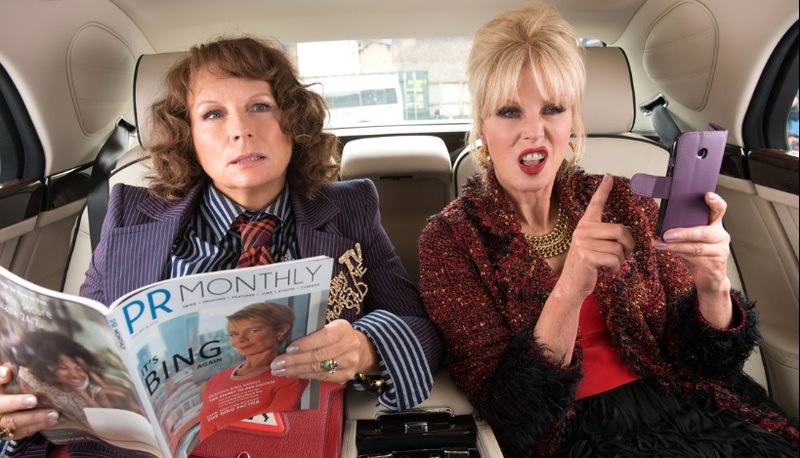 Enjoyment of Absolutely Fabulous: The Movie depends on prior knowledge. You have to know who these people are, why they’re behaving as they do, why the mother is the child and why the daughter is the mother-figure to get the joke. Without it you’ll forever feel like that designated driver; you’re witnessing the party but you’re not really part of it. 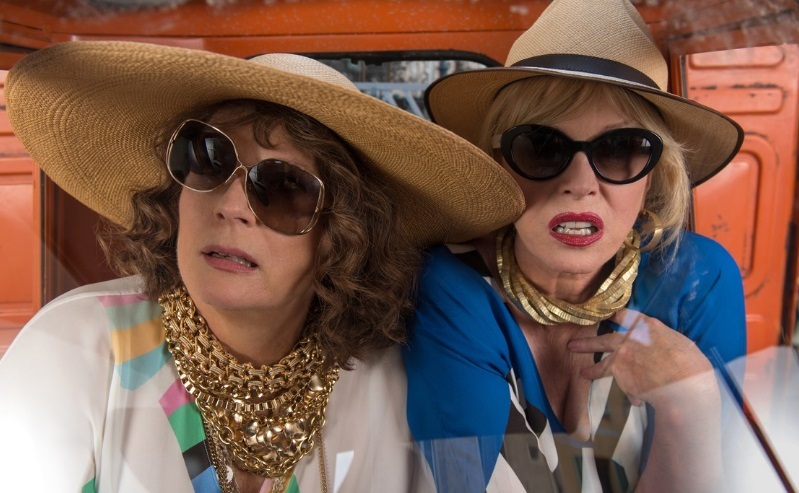 Running at a scant 86 minutes, the film can be thought of as being either a celebration or a valentine of everything you’ve ever known about Ab Fab during the height of its TV popularity. All characters return and all are played by the original actors, plus there’s an endless array of cameo celebrities. American audiences will know some, but not all. Then Eddy overhears a nugget of celebrity news. Supermodel Kate Moss (the real supermodel Kate Moss) has left her PR agent and might be looking for a new one. Determined to snag a new client, Eddy overdoes the casual approach at a party and accidentally knocks the model over a balcony and into the inky blackness of the River Thames. The model never surfaces. On the run from possible manslaughter charges, Eddy and Patsy flee to the South of France. Saunders and Lumley are much beloved together – and deservedly so, they’re a great TV comedy duo – but that chemistry created on the British telly doesn’t transfer quite so well to the larger screen when nothing new, other than age, is developed. There are no big laughs that come from clever dialog, just a lot of eccentric pratfalls and oddball behavior that bring smiles of recognition, but that’s only as a result of knowing and having been with these people before. Newbies may be clueless.